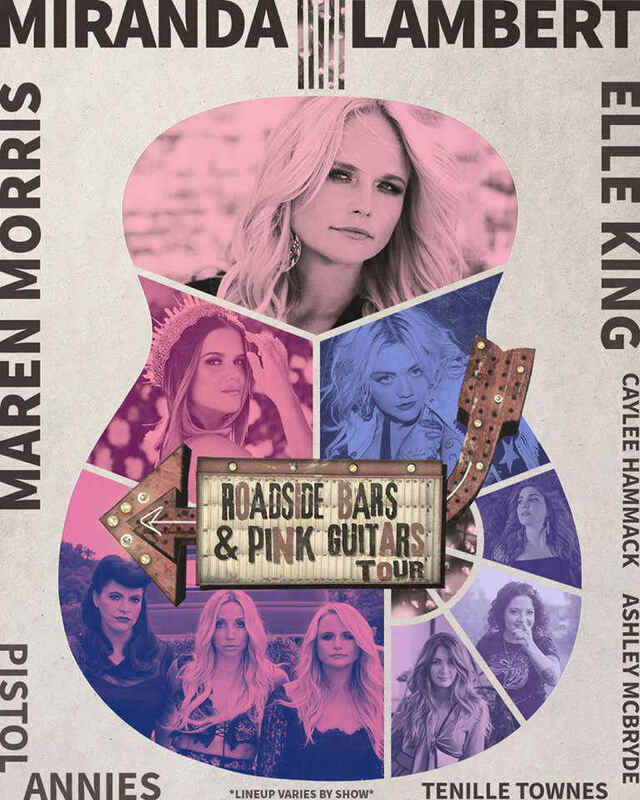 Miranda Lambert is bringing some friends with her on the Roadside Bars & Pink Guitars tour in North America from September to November. Joining the country musician as the opening act on select dates will be Maren Morris, Elle King, Ashley McBryde, Tenille Townes, and/or Caylee Hammack. Additionally, there will be sets with Pistol Annies, featuring Miranda with Ashley Monroe and Angaleena Presley. Lambert also has a handful of music festivals scheduled during the summer. Check the ticket links below for the specific lineup information. When do Miranda Lambert 2019 tickets go on sale and what is the presale code? The general public on-sale begins as early as April 12. Presales for Citi cardmembers and Miranda Lambert fan club will begin on April 9. Elle King fan club, Spotify, Ticketmaster, Ticketmaster Mobile App, and local venues / radio presales will follow. For the Citi presale, you can use the promo passcode 412800, but you will need the card to complete your purchase. The Live Nation / Ticketmaster presale password is VIBES and the LN Mobile App code is COVERT. Keep in mind, each date is different and details are subject to change. Click through the individual concert links for more information about the show you're interested in. We recommend following Miranda Lambert on her social media accounts and signing up for her free email newsletter, in addition to connecting with your local venue, to get the most up-to-date information. For concert tickets and more, check out Miranda Lambert's Zumic artist page.